Sorry for the lack in posting these last couple days. The Don has been working in Idaho for the last few weeks so I decided to hop on over for a long weekend to visit him and to catch up with my friends and family that live in the area. My first evening and day here were perfection... great food, great company and my favorite thing to do in Idaho; thrift store shopping (post coming soon on this adventure). On Friday I met up with some friends for a morning run. On the last mile my foot found a hole in the trail. Next thing I knew I was getting xrays and being told that I had both a severe sprain and a break in my ankle (wasn't aware those two things could happen at once). I cancelled my flight back to Seattle and have made myself a little temporary home out of The Don's hotel room where I have been elevating, icing, knitting (just learned how!) and watching old movies while I wait for my ankle to be ready to get me back to Seattle. My big plan is to hobble my way through the airports on Wednesday afternoon with my super stylin' walking boot and crutches. I hear the airports are pretty great about wheeling around gimps such as myself. I have a few street style shots left from before I flew out of Seattle. You might be getting a few more food shots then usual until I'm up and and wandering the streets looking for Seattle's stylish again. I am really going to miss walking these next couple weeks. My feet are my car in the city. All I know is that I am going to have to work extra hard at yoga when this ankle gets better because Don has been bringing me a lot of tasty food from my favorite Boise restaurants since this happened last Friday and it turns out elevating your foot doesn't really burn any calories. Oh, and the picture! I went in search of a fun photo of crutches and came across this old postcard from the Basilica of Sainte-Anne-De-Beaupre in Quebec. Historically it has been credited with many miracles of curing the sick and disabled. While the church was being built one of the people working on it needed crutches to walk but once the church was complete he was able to walk on his own. 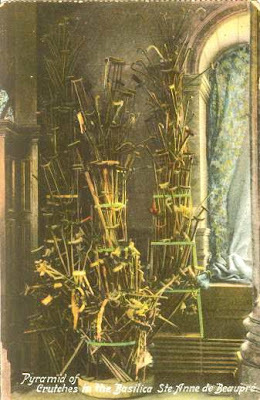 Since this day people have left their canes and crutches at the church as a testimony of their healing which over time has created the Pyramid of Crutches. I thought this was a neat story and I loved the photo.